Teres Minor is a narrow muscle which lies below infraspinatus, above teres major and triceps brachii, and deep to deltoid. It is one of the four muscles which comprise the Rotator Cuff. 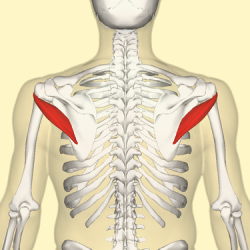 The upper two-thirds of the lateral border of the scapula. The upper fibres end in a tendon which inserts into the inferior facet of the greater tubercle of the humerus. The lower fibres insert into the humerus directly below the inferior facet of the greater tubercle of the humerus. The axillary nerve (roots C5, C6) from the posterior cord of the brachial plexus. The circumflex scapular artery and the posterior circumflex humeral artery. Teres Minor, along with Infraspinatus, primarily produces external rotation of the shoulder joint. It assists in adduction and extension of the shoulder. When the humerus is stabilized, abducts the inferior angle of the scapula. In concert with the other rotator cuff muscles, Teres Minor is instrumental in providing stability to the shoulder joint, and helps to hold the humeral head in the glenoid cavity of the scapula.